Tyrol: Yeah, well… it’s breakfast, lunch and dinner until someone finds a hot fudge planet. That quote above has nothing to do with this post. I was just amused by it. I’ve been under the weather since Friday, so that’s why I’ve been MIA most of this week. I’m blaming the punchy humor in this post on the meds. In the comments of last week’s BSG post, commenter Brian asked me to elaborate on the Ship of Lights and/or Beings of Light. So, here goes. 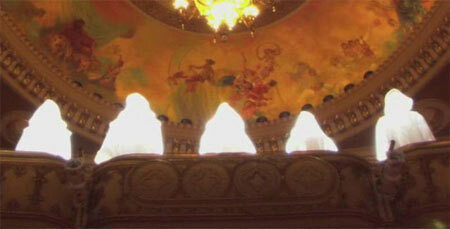 Below, the Final Five from the D’Anna Beirs/Number Three’s vision of the Kobol Opera house in the episode Rapture. 1. In scripts for the episodes for which they appear, the Beings of Light were also referred to as “Seraphs,” a term implying a connection to Seraphim, the highest ranking angels in the Bible. 2. 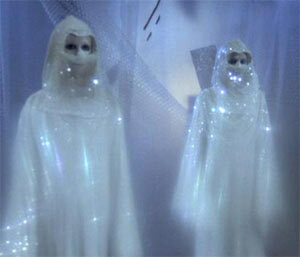 The Beings of Light appear in three episodes of Battlestar Galactica and Galactica 1980 and are represented not only by ethereal beings clad in white sparkly robes, but also by three specific characters: Count Ibis, Angela and John. 3. Count Iblis appears in the original series episode “War of the Gods,” as a rogue Being of Light who kills Apollo. The Beings of Light then take Sheba, Starbuck and Apollo onto their ship, resurrect Apollo, and give them directions to Earth. Watch part one and part two of this episode. 4. Angela appears in the Galactica 1980 episode “The Return of Starbuck,” which explains Starbuck’s final fate through a dream as retold by Dr. Zee. In this episode, Starbuck finds himself stranded on a planet, alone, after a dogfight with Cylon Raiders. Starbuck builds his own Frankenstein Cylon named “Cy,” who finds a mute and pregnant Angela on the planet and brings her to Starbuck as human company. After a few days of no conversation, Angela suddenly asks Starbuck “Would you die for me?” Angela remains enigmatic and refuses to elaborate on how she came to be on the planet. She also starts referring to her unborn baby as “our child,” meaning her and Starbuck, and indicates a vehicle must be built to transport the baby. Brian goes into some details about the original series that I didn’t include here, and might be helpful. Specifically, I like what he’s suggesting about Shelly Godfrey and Leoben-not-Leoben as well as the nature of Inner-6 and Inner-Baltar. Hi, thanks for writing this. I am very interested in the show, but find the forum on scifi.com to be unreadable. You mentioned D’ana seeing the final five and apologizing, saying, “I had no idea.” I think this refers to her appearance as a reporter on Galactica. During that time, she sets up Tigh and gets him drunk before his interview, making him very angry. She is apologizing in the temple to Tigh for her behavior, not to the final cylon. Leoben mentions “Adama” is a cylon. I think he is telling the truth, but he is referring to Joseph Adama, Lee’s grandfather. If you read about the upcoming prequel called “Caprica,” you find it set on that planet prior to the first war and that Joseph Adama will be a main character. The story is obviously sketchy so far, but will involve the building of the first cylons. Also, it appears at least some humans will be “downloaded” or “resurrected” in cylon bodies in that time period. The hybrid in “Razor,” who says his children see him as god, is probably the human inventor of the cylons (apparently, to be named Daniel Graystone), kept alive through the hybridization process. My guess is Joseph Adama also became some sort of cylon, which makes Leoben’s statement technically correct, but misleading. If my guess is correct, we’ll see a flashback episode to pre-war Caprica sometime soon (which, hey, will just happen to introduce a new TV series). This “may” make the downloaded Joseph Adama cylon 7. Originally, I bet cylon 7 would be Doc Cottle, but another character is now the odds-on favorite. If, I am right, it would be quite a spoiler, but I think you can guess who it would be. As far as the Starbuck/Ship of Light mystery, I am less sure. However, I have a theory: the gas planet where Starbuck disappeared cloaks a small wormhole that transports her a great distance. Since she keeps painting what looks like Jupiter, I am guessing the other wormhole is located in the actual Eye of Jupiter. In a real worm hole, matter would be destroyed as it enters. So, assuming they stay with the science, that would require someone or something on the other end to reconstruct the matter, presumedly, the beings of light. This would explain why Kara says her body feels different and why her ship was rebuilt perfectly. It also (kinda) explains the time dilation and that she has no memory of the transit in either direction. I have a bunch of other thoughts on the story, especially of the whole “harbinger of death” thing, but thought I would toss this stuff out there for consideration. Hi olds88, thanks for stopping by. I find the SciFi Forums very confusing too. Since I wrote the original post a few weeks ago, I have been thinking that D’Anna may not necessarily have been talking to the Final Cylon. I made that assumption as many people have, but there’s nothing that says that is indeed the case. She very well may have been talking to Tigh and that would make sense. When I first heard the Joseph Adama is a Cylon meme, I thought it was kind of lame, but I’m warming up to it. I don’t think he’s THE Final Cylon, though, since he hasn’t ever made an appearance on the show. I do think that Lee’s comments to his father that if Zac came back a Cylon, he would still be Zac is setting up what will happen to Joseph Adama in Caprica. However, another commenter Brian thinks that Romo Lamkin is the Final Cylon — it would not be a huge stretch for him to be Joe Adama in cognito. Graystone as the Razor hybrid is a fantastic idea and I’m on board with that. I like the idea of the nebula where Starbuck disappeared being a wormhole to the Red Spot of Jupiter. That would make the wormhole an Axis Mundi symbol in BSG. I’d love to hear what other thoughts you have. Heh. Actually, Romo Lamkin was the character I was alluding to as being the possible cylon 7– and the repository of Joseph Adama. Ã¢â‚¬Â¢ He’s a brilliant defense lawyer, just like Joseph Adama. And he just happens to have known Joseph Adama. I think in season 3 he said Joseph Adama “taught me everything I know”– even though he seems a bit too young for that to have been possible, unless he doesn’t age. Ã¢â‚¬Â¢ Beyond that, he seems keenly interested in the life of Lee Adama. In fact, this otherwise minor character is responsible for completely for changing the trajectory of Lee Adama’s life. Ã¢â‚¬Â¢ Stranger yet, he is comfortable talking to a cylon, and has no trouble emotionally manipulating Six– even though he has presumedly never met a cylon before. Ã¢â‚¬Â¢ Stylistically, his mysterious air implies he has a bigger role than a one-time walk on. He’s detached from everyone else and the situation they are in– always one step ahead and slightly amused even when people try to kill him. He is also the owner of the only known pet in the BSG universe. If he is Joseph Adama, he would no doubt be aware of that. His character would almost certainly not be aligned with the cylons, but more of a quiet protector of humanity. He may have been the person who told Bill Adama there are only 12 cylon models (probably Baltar though). It’s also possible that Leoben’s claim was referring to Joseph Adama, but that Joseph became another hybrid or was downloaded into an early mechanical cylon. That wouldn’t be as interesting though, just a red herring. My early money was on Doc Cottle because he is similarly aloof and seemingly indifferent to the fate of humanity. He was also in a position to watch over the hybridkids and to tell Baltar there was no chip in his head even if there was. I still think he will have a larger role in the story, but maybe that’s just because I like the character so much. Thanks, I’ll get to the other stuff later. D’Anna may also have been talking to Anders in the temple when she asked for forgiveness, since she almost shot him on Caprica when the building exploded. Can’t think of anything she did to Torrie or the Chief though.